Tony Cascarino has urged new Arsenal manager Unai Emery to get rid of Super Eagles forward Alex Iwobi and eight other players in the club.Emery was named as Arsenal manager yesterday to replace Arsene Wenger who left the position at the end of the season. 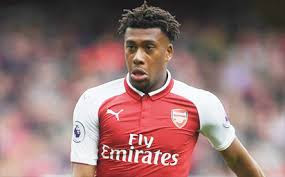 Former Chelsea star Cascarino believes the 22 year old is limited.“I don’t think he will ever be a top-four player, which is what Arsenal need,” Cascarino told The Times.co.uk regarding Iwobi. Hector Bellerin, Petr Cech, Shkodran Mustafi, Laurent Koscielny, Calum Chambers, Granit Xhaka, Aaron Ramsey and Mesut Ozil are the other players in the Arsenal squad Cascarino wants Emery to show the exit at the club.Iwobi who is currently with the Super Eagles in preparation for their 2018 FIFA World Cup in Russia featured in 39 games for Arsenal and scored three goals and provided seven assists.